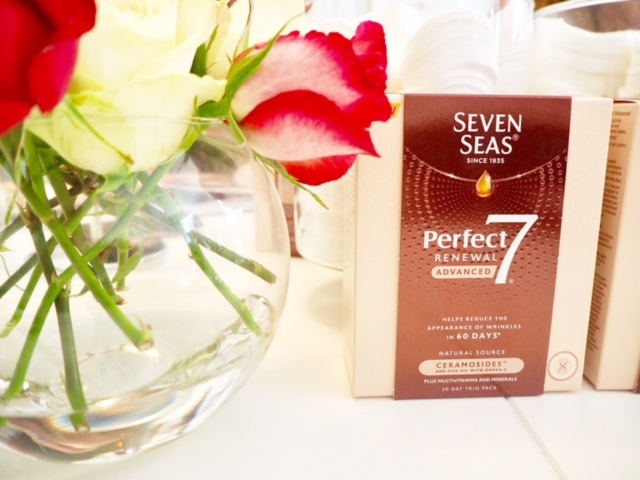 A couple of months ago I was invited to partner with Seven Seas to trial the new `Perfect7 Renewal Advanced’ It was claimed that the products scientifically reduced the appearance of wrinkles in 60 days so of course I jumped at the chance! 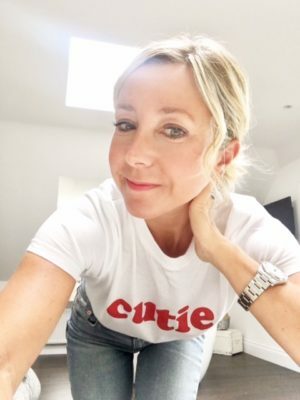 Anything to hold off the ageing process when you are in your forties is a winner with me. Of course with anything beauty related I am always sceptical. I find trying new products exciting but always remember that there are so many factors when it comes to keeping your skin looking beautiful. Does anything really help? Is it ever too late? Taking a an exciting new beauty ingredient orally that has proven results could be something that just becomes automatic and part of our daily routine. When we struggle just to keep up with the many factors that affects our skin and general well-being. One easy option maybe……helping ourselves from within. We will see…. I am sure that most people are aware of Seven Seas They have developed formulas which support health and nutrition for over 80 years. Their philosophy is the belief that a cornerstone of healthy living and great nutrition. Backed with their scientific expertise and standard of excellence Seven Seas are committed to offering people reassurance they are guaranteed to be taking the highest quality oils and nutrients and making them into expertly formulated supplements. All very interesting but do they work?…. 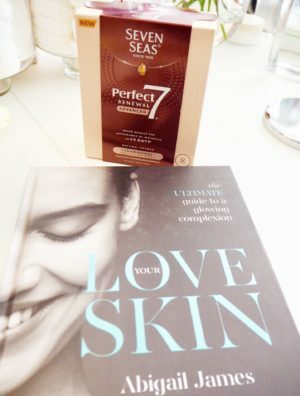 All participants in the Perfect7 Renewal trial were tested using her skin analysis machines which measured the surface of the skin to see if it looks any better before and after taking the supplement. The measures examined the appearance of smoothness, elasticity, roughness and wrinkles on the skin. Perfect7 Renewal Advanced is the first UK beauty supplement to contain Ceramosides, which are a natural source of Ceramides. With ageing our skin loses moisture, firmness and smoothness. Skin Ceramides are lipids that make up 50% of the ‘cement’ that binds together protective cells in the outermost skin layer. An easy analogy would be that Ceramides are the mortar between bricks if bricks were your skin cells. Ceramides are naturally found in the body but as we age levels drop, skin moisture is lost and the appearance of wrinkles can occur. Perfect7 Renewal works from the inside out for more hydrated looking skin, from within. Perfect7 Renewal Advanced contains a Ceramosides capsule. 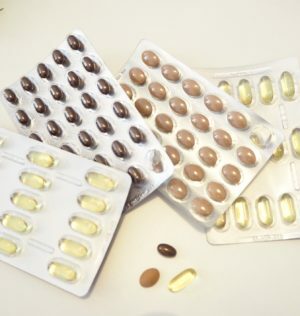 And also a multivitamin and mineral tablet which contains Zinc for healthy nails, Biotin for healthy hair and vitamin C for collagen formation and a Seven Seas Omega 3 capsule. How have I found taking the product? So three pills to take daily. For me I am all about routine! My routine has been quite different during the trial mainly because it has been the summer holidays. Both the children have been off, we went on holiday to Greece and Jane’s taxi service has been in full swing! As well as trying to keep up the daily madness of house tidying and work! I normally take any regular pills in the morning. I am not a big fan of breakfast (yes I realise that is not at all good) so I will normally grab a coffee and glass of water and take what I need. I found with Perfect7 due to the fact there are three tablets I did need to eat first. During the trial I am not sure that I kept to specific time, it did however very quickly become part of my daily routine. I think over two months I forgot to take them once! New Perfect7 Renewal Advanced, £39.99 is available to buy now and New Perfect7 Renewal £34.99 (Duo pack contains a 30 day supply of Ceramosides capsules and an Omega 3 capsule.) Both are currently on a 3 for 2 offer and exclusively available at Boots nationwide.